We offer gentle adjusting techniques. 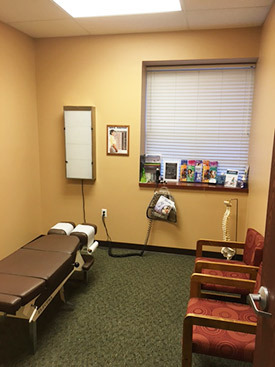 You’ve probably heard of a chiropractor before, but you might not be sure what exactly we do. Chiropractic is a natural approach to allowing your body to function better by reducing stress on the spine. The spine controls everything in your body, directly or indirectly. If pressure is applied on the spinal nerves, the area that nerve controls will eventually decrease in function. By correcting misalignments, or subluxations, your body can heal itself and function at its highest levels, the way it was meant to. A chiropractor is specially trained to work with these subluxations. Love this place! Dr. P has really helped with my low back and hip pain. I always feel better when I leave because it is such an upbeat office. There are three types of stress that can affect your body: physical, chemical and emotional. The physical one can be injuries and other trauma that result in pain. Chemical and emotional stresses, however, affect you more subtly and take longer to undo than the effects of physical stress. By giving you a chiropractic adjustment, we reduce the physical stress to help you feel better. We’ll then work with you to decrease mental and emotional stress so that your body can function at a higher level. Koren Technique is an advanced technology that allows us to give you an adjustment sitting, standing or while in movement. Since we’ve started our patients on this technique, we’ve seen great success. There are no twisting movements or popping sounds. Dr. Parks has never seen a patient that has had an adverse reaction to an adjustment. Over his many years of experience, he’s learned gentle techniques that are great for all ages and conditions. Chiropractic is safe, and chiropractors have some of the lowest malpractice rates out of any medical specialty, meaning that it is an extremely conservative option for your health care. Adjustments don’t hurt, and Dr. Parks has a light touch. Free parking is available, and you won’t have to wait long to get in for an appointment. We accept insurance. Schedule your free consultation today by contacting our office!